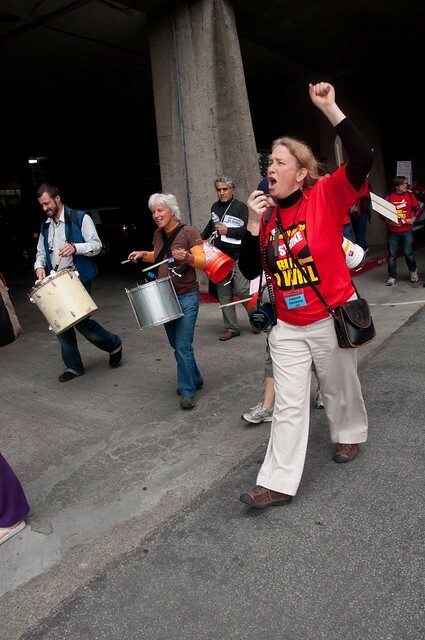 Protesters at the California Faculty Association strike march through to the Cal State East Bay campus. Nov.17, 2011. Photo by Nelson Estrada. A few hundred faculty members and students gathered at Cal State East Bay today for a one-day strike approved by the California Faculty Association earlier this month. 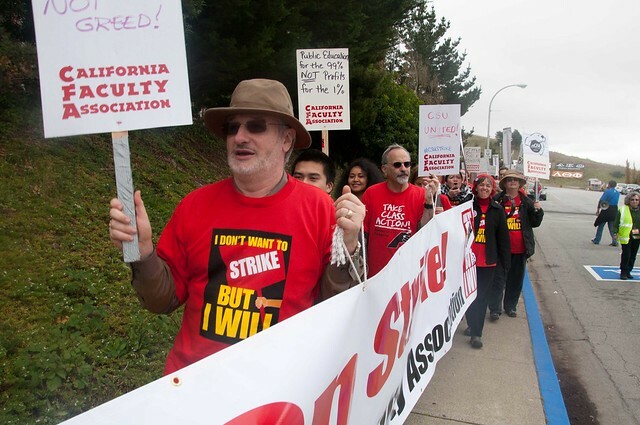 The strike stems from years of tense negotiations between union members and the California State University system for pay increases that were denied to the faculty for two years. While the contract promised faculty a pay increase, the CSU cited the contract’s allowance for changes to be made in order to cope with economic hardship. Some students crossed the picket line today in order to turn in assignments despite some entrances being blocked off by strikers. Cars are still being allowed to pass through as needed. Students for Quality Education stayed the night at Cal State East Bay last night in preparation for the strike. Approximately 50 students from the SQE SF State Chapter, Cal State East Bay Chapter and Sacramento State University Chapter stayed the night. SQE is an organization in the CSU system that focuses on educational rights within public higher education through student movements. The Cal State East Bay Police Department said they allowed students to “stick around” but they were not allowed to sleep, camp out or set up any sleeping bags or tarps. A canopy and tarp were both removed by police yesterday when students first gathered near the center of campus around 1 p.m. There were no arrests last night and the strike is set to continue until 5 p.m. The CFA strike is also taking place at Cal State Dominguez Hills for the CSU campuses in Southern California. 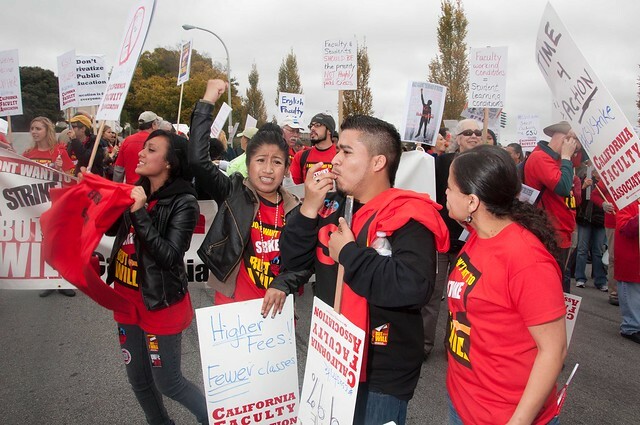 CSU East Bay students lead chants during the California Faculty Association strike Nov. 17. From left to right: Jessica Gallegos,19, Jessica Cruz,19, Miguel Pimentel,20, Maria Jauregui, 24. Photo by Nelson Estrada. Protesters at the California Faculty Association strike delay cars from getting through the Cal State Easy Bay campus Nov.17, 2011. Photo by Nelson Estrada.